Modern synthesis merges with ancient instruments and serene choir sounds in this cosmic meditation music. It is soothing, abstract and utterly transcendent. 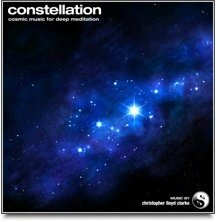 Constellation is a unique meditation music composition that consists of carefully sculpted white noise sounds blended with Tibetan singing bowls, celestial choirs and pure bells. This music is designed to transport you to a place that is beyond all thought and emotion - to a state of complete stillness and peace. Constellation is 60 minutes of uninterrupted music. As the music unfolds, it gradually becomes more and more sparse, more and more abstract. Around half way through the hour, all the instruments slowly fade away until only soft, swirling white noise remains. This leaves you with a quiet space to surrender yourself to, as you sink ever deeper into a state of transcendent meditation. For the best experience, please listen quietly with headphones.